I’m ordinarily a big fan of blizzards, but today this Happy Trudger isn’t at his happiest. I lay there waiting for the incredible explosion of pain in my right shoulder to subside enough to see if I could get up. 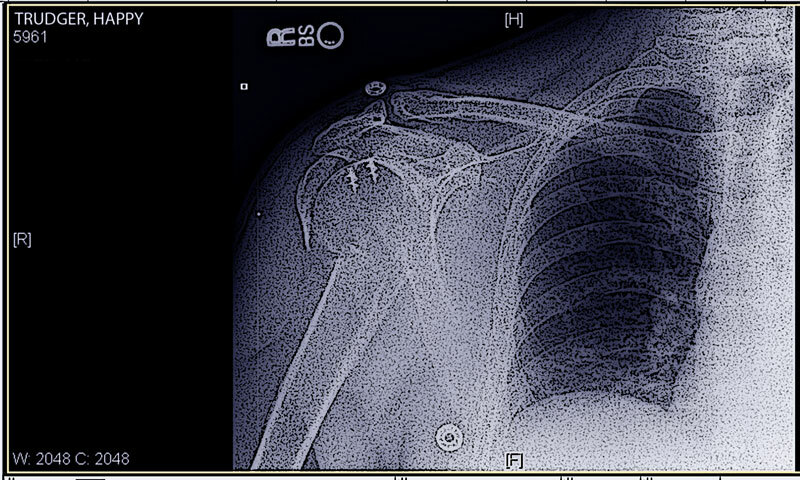 A 911 call and a trip to the hospital later, it turns out that the bones in my shoulder did not fare so well — multiple breaks of the shoulder, including fracturing the main bone of my upper arm into ten pieces. In case that wasn’t enough, I’m right-handed. I’m gathering myself for surgery tomorrow morning. They’re going to be doing quite a patch-work job, complete with steel plates and screws. The pain from this injury is intense. I gather the post-surgical picture is a long and painful one: I’m taking medication for pain as prescribed and they’re barely making a dent. If it weren’t for Dragon Dictate, no way I could write this post, and I’m really not sure when I’ll be able to write the next one. I’ve received blessings from friends and family expressing love, prayers and generosity. I’m very fortunate to have good, caring medical professionals around me — I was treated to my first 911 ambulance ride, which was pretty exciting. My business clients have for the most part been understanding and patient as well, at least up to now. I’m impelled by hard circumstances into a graceful acceptance that I am powerless over so much, but that I can ask for help when I need it, and the help — in often unpredictable form — will arrive. I’d rather move forward in acceptance and grace than in fear, resentment and self-pity, and I’m getting plenty of practice. Happy salted and sanded trails! PS Monday was 01.10.2011, a pretty interesting date. It’s also the binary way of writing the number “27.” What 27 has to do with any of this, I’m still waiting to figure out — but you can bet I’ll be counting!